US Auto industry complains about mileage standards. While GM/Ford hire lawyers and lobbyists, China, Japan, Germany hire engineers. BTW, keeping fuel use high yet one other bonus to Oil export-dependent Russia and Vladimir Putin. See how that works? The Environmental Protection Agency is rolling back one of the biggest, most impactful environmental regulations of the Obama era, giving a boost to America’s big three automakers. EPA officials announced Monday afternoon that they intend to weaken greenhouse gas and fuel economy standards for cars and trucks as a favor to automakers. “[I]n light of recent data, the current standards are not appropriate and should be revised,” the agency said in a statement. The current rules were designed to limit carbon emissions and pollution from transportation, which has overtaken the power sector to become America’s biggest climate problem and remains the largest source of air pollution. The standards would avert 570 million metric tons of greenhouse gas emissions by 2030, equivalent to stopping 140 typical coal-fired power plants for a year, the Union of Concerned Scientists has estimated. They’d save consumers money too. According to Margo Oge, former head of the EPA’s Office of Transportation and Air Quality, the fuel savings alone through 2025 would add up to $1.7 trillion. While some car companies say they support the current rules, trade groups like the Alliance of Automobile Manufacturers have been clamoring to lower the goalposts for fuel economy and tailpipe emissions since President Trump took office, arguing that the current regulations are too stringent and expensive to meet. Relaxing the rules would let companies like Chrysler and GM, which scrape the bottom of average fuel economy rankings, breathe easier. But it also pulls out the rug from under carmakers that top the efficiency list and are ahead of schedule to meet the higher standards. Many of these companies with very fuel-efficient lineups earn revenue from selling emissions and efficiency credits to other manufacturers that aren’t able to comply with the stringent rules. And the company that perhaps earns more from this side market than any other is Elon Musk’s electric carmaker, Tesla. That means the weaker regulations will simultaneously help the dirtiest, hurt the cleanest, and derail years of tenuous progress in reducing environmental harm from a growing source of pollution. First, some brief history: After the 2008 financial crash and the ensuing economic crisis, Chrysler and General Motors were on the ropes and came to Congress with their hands out looking for a bailout. They received cheap loans and financial assistance under Presidents Bush and Obama totaling almost $80 billion, with a net cost to taxpayers of $9.3 billion. A big reason US car companies were foundering was that gas prices suddenly shot up and US automakers, who for years were making bigger, thirstier cars, were suddenly facing a cash-crunched, fuel-abstemious market. So the Obama administration told US car companies they needed to reduce their greenhouse gas emissions and improve their efficiency to better compete with foreign automakers, marking the biggest increase in fuel economy regulations in 30 years. This manifested as a combination of rules across the EPA, the National Highway Transportation Safety Administration, and the California Air Resources Board finalized in 2012. The key target is that automakers have to reduce their average greenhouse gas emissions from the passenger cars and light trucks they sell to 163 grams per mile by 2025. 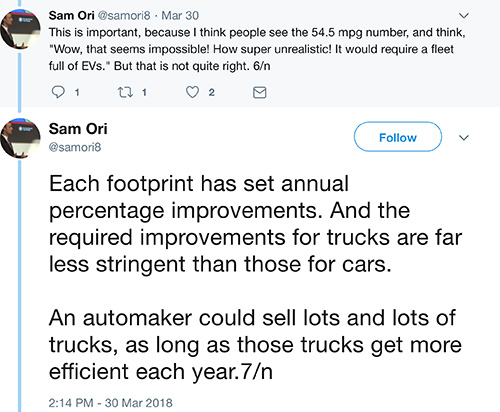 A subtle point here is the EPA estimated meeting this goal with just fuel efficiency improvements means car companies would have to achieve an average economy of 54.5 miles per gallon across their offerings, assuming more cars than trucks are sold. However, a car company can reduce its greenhouse gas emissions with tactics like limiting coolant leaks and by buying credits, while a shift to larger vehicles like SUVs changes the weighting of the average fuel economy target. Based on current trends and projections, the EPA estimates that the current rules will require a real-world average fuel economy of 36 miles per gallon by 2025, up from 24.7 miles per gallon in 2016. To make sure the rules are working, the EPA is required to conduct a midterm evaluation to make sure manufacturers are doing their best and to see whether the rules are too strict. The Obama administration reported in January 2017, shortly before Trump took office, that everything was hunky-dory. Scott Pruitt said it wasn’t. This retreat would also be bad for business. Selling gas-guzzling cars and trucks might continue to drive short-term profit, as some in the auto industry believe, but abandoning the standards now in place would run counter to the longer arc of consumer demand, state regulations and international market forces. Looser standards now, when consumers and many states are demanding cleaner cars, would spell trouble for the auto industry. One of the biggest speed bumps for this deregulatory effort will be California. The state has the unique, and congressionally mandated, right to set emissions standards for itself that are higher than federal limits. Under Section 177 of the Clean Air Act, around a dozen other states have adopted California’s standards, which match the current federal requirements for fuel efficiency. Officials from those states have said they would go to court to challenge any effort by the Trump administration to weaken the current standards. Those states represent about a third of the American auto market. Relaxing the federal standards would fracture the American car and truck market and leave automakers facing the prospect of producing different cars to meet different standards — undoubtedly a costly undertaking that consumers will bear. And the litigation would cloud the future and frustrate planning. Rolling back these regulations would also steer America in the opposite direction of where the rest of the world is going and make domestic manufacturers less competitive. Norway has set a goal of restricting sales of new vehicles to electric or plug-in hybrid models by 2025. France and Britain have pledged to end the sale of diesel and gas cars by 2040. Germany, the Netherlands and India are actively considering similar moves. Perhaps most important, China has a new zero-emission-vehicle mandate, modeled on the California program, which requires that such vehicles represent 8 percent of new car sales in 2018 and 12 percent by 2020. China is already General Motors’ largest market. Not all automakers want to weaken standards. Bill Ford, the executive chairman of Ford, and Jim Hackett, the company’s president and chief executive, said in a statement this week, “We support increasing clean car standards through 2025 and are not asking for a rollback.” They called for “one set of standards nationally,” but also “flexibility” in meeting them. G.M.’s chief executive, Mary Barra, whose company has invested in the hybrid Volt and all-electric Bolt model, has expressed support for keeping the current nationwide fuel economy standards and has sought an extension of tax credits for producing electric vehicles. Toyota expressed its commitment to “help keep our winters winter” in an ad campaign during the Winter Olympics. And Volvo and Jaguar have declared that their entire fleets will be “electrified” in the near future. But at the same time, the main American industry trade group, the Alliance of Automobile Manufacturers (“We are the voice for a united auto industry”), has continued its drumbeat for weaker standards. What gives? n the wake of Pruitt’s determination that the Obama standards were too stringent, the most important question is what will happen to California’s standards. Dating back to the Clean Air Act of 1970, Congress recognized a special role for California, which was ahead of the nation in tackling pollution. California was permitted to set its own air pollution standards, as long as it received a waiver from the U.S. EPA certifying that the state standards were at least as protective of public health and welfare as federal standards and that the state had shown they were necessary to meet “compelling and extraordinary conditions.” Over the years, California has received more than 50 such waivers and has led the nation in requirements for catalytic converters, unleaded gasoline and other air pollution advances. More than a dozen states—accounting for more than 40 percent of the U.S. car market—have set their light-duty vehicle standards based on the California standard, as they are permitted to do under the Clean Air Act. Pruitt’s action today does not undo that—and it’s not clear that it ever will. “The auto industry will only make one ‘car’,” said David Bookbinder, chief counsel for the Niskanen Center. That means that the California standard serves as a de facto national standard. “California is the whole game,” he said. And California has made clear its commitment to cutting greenhouse gas emissions from autos, with Gov. Jerry Brown in January setting a new target of 5 million zero-emission vehicles in California by 2030, up from the state’s prior target of 1.5 million by 2025. The automakers, said Freeman, may end up “like the dog that caught the car”—getting something it really doesn’t want: more litigation and uncertainty. « Updating: Will Gas Break Wind? Will Wind Pass Gas?